PAZAN GALLERY | Picture Framing | Photo Restoration | Art Restoration | Fine Art Printing | Port Credit | 905-278-1374 - PICTURE FRAMING AND PHOTO RESTORATION SERVICES IN MISSISSAUGA? Pazan Gallery is located in the beautiful Village of Port Credit and is dedicated to providing award-winning, socially conscious, "white-glove" creative services. 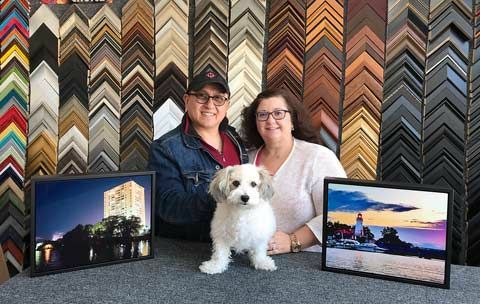 We offer a high-level of service and knowledge base with regards to; custom picture framing for your wall art, photo and art restorations, graphic design, and fine art printing and reproduction of photos, artworks or important documents. We have over 1000 Picture Frame samples to choose from. We can digitally restore your precious photos or repair some forms of damage due to age, water damage, mould etc. Most work take 10-14 days to complete but rush orders are available at a premium.